Do you know what today is? 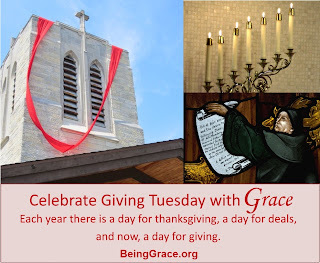 Today is Giving Tuesday. Each year we have a day for thanksgiving, a day for deals, and now, a day for giving. We are so grateful for the giving that many of you participate in each week, it is because of you that we are able to follow through with our mission statement --acting and speaking Christ fearlessly. Today we invite you to participate in Giving Tuesday with Grace Lutheran. We have recently installed a new feature on our website that will allow for you to donate online. You can try it out now by clicking the blue "donate" button on the left hand side bar. As always, thank you for all that you do for our little church on Montrose.